TDA2030A or TDA2030 is a well used class AB audio amplifier IC. 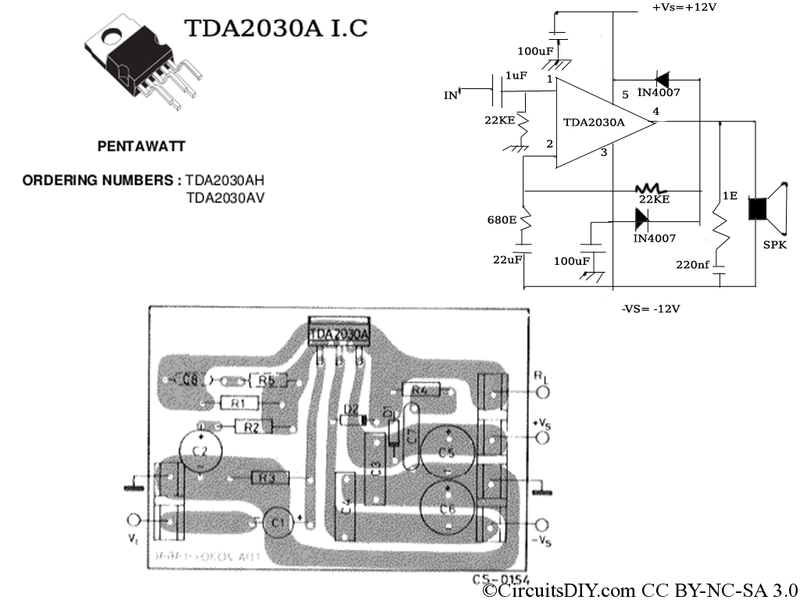 TDA2030A amplifier circuit is mostly used in nowadays home theatre systems for it’s some good features. This amplifier circuit require less external components too, making it easier for a beginner to make this on Veroboard or Perf Board. This can be operated with single supply line, but that topology gives less output power, hence this bi-voltage topology is used everywhere. We need to provide +/- 12V to it. We can easily get +12V and -12V from a 12-0-12 CT step down transformer. As this IC doesn’t require regulated supply, we can feed voltage directly to the TDA2030 amplifier from a rectifier with just a capacitor. The filter capacitor is usually 1000 uF to 2200 uF, we can use even bigger capacitor for better results. Well, the IC costs around 25 rupees, and together with all other materials as PCB, other parts the cost of final board doesn’t exceed 70-75 rupees. I made audio amp circuit using tda 2030a ic. I use 4.7uf(63volt) cap for audio coupling but the out put sound is not stable and need much input voltage. What is the problem? can i use 10uf(25volt) cap ? Exactly where you’re using this capacitor in this tda2030 amplifier? For audio in 10uf (16 to 25V) is good. Now is it possible to interchange centre unmarked with rear left, or do I just replace the faulty Rear left IC? I made this circuit of dual power version & powered it using 12-0-12 volt 1 Amp tranformer but after working fine for some time the TDA2030A IC burnt out even after using a large heatsink. TDA2030 should be capable of of 12 watt easily, so there’s a possibility of cheap ICs with internal short circuit. I can see no other reason of IC burning even after using a large heatsink. how can i use 12v dc instead of transformer ?? Just connect the battery instead of the transformer, that’s it. That was not the problem. I could find the problem and now it works goodly. Thanks for reply. hi.i have 5.1 board with tda 2030 ic for 5 channels and stk 4141 subwoofer ic.can i connect it with a 27-0-27 volt 5 amp transformer with 50 volt 10000mfd capacitor? i am connecting an external sub woofer board with the same supply…will the 5.1 board get any problem?